This content is sponsored by Smugglers' Notch Vermont, America’s Family Resort has been redefining the family vacation for over 50 years. From award-winning children's programs to some of the best skiing and snowboarding in the East, a Smugglers' Notch vacation invites families to unwind, have fun, and experience the best of Winter together. Call 1-800-451-8752 today, or visit Smuggs.com today! Our ongoing search for resorts that offer the best value in a family ski/ride vacation continues. How do we define best value? The "value" of a winter family vacation lies in the quality of the experience, the overall sense of satisfaction and the creation of great shared memories. While price remains important always, value is not all about price. In judging a potential vacation for its value, we remind you to look at the big picture, imagine yourself in that picture, and try to best evaluate the fit. This year, we've added some new resorts to our list and revisited some of our past favorites. Please bear in mind our past recommendations: Value Vacation Destinations Vol. 1, Value Vacation Destinations Vol. 2 and Value Vacation Destinations Vol. 3, and Value Vacation Destinations Vol. 4. Smugglers' Notch, VT (www.smuggs.com): We rank Smuggs among the best of the best. They've created a family paradise, with a self- contained base village, programming for everyone and all-in-one pricing that's flexible if you overlap weekends or high-season days, you only get charged high-season rates for those individual days. Their low-season (pre-Christmas, early January, late March) packages offer incomparable value. And, the programming, both on- and off-slope, is consistently creative and of high quality. Downside: It's a fair piece to drive from many northeast population centers, getting from the main base village to Madonna and Sterling Mountains can be cumbersome, and ageing lifts might annoy some. Le Massif, QC (www.lemassif.com): First of all, this is Quebec, and to travel here is to get a taste of Europe without the overnight flight and jet lag. But, more than that, Le Massif is a manageable size, offers some of the most spectacular St. Lawrence River Views imaginable, serves no junk food on-hill, and will take wonderful care of your little ones. The snowsliding is enormously fun, too, especially when you're speeding down the hill and it seems like you'll slide right into the frozen river. Downside: there's no slopeside lodging as yet; the weekends can be crowded, especially on the popular runs; and the day care facility, while new, is a bit small. Loon Mountain Resort, NH (www.loonmtn.com): The combination of a manageable size with sufficient terrain pleases most abilities. 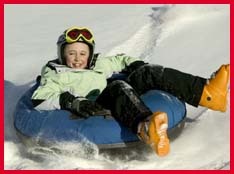 There's plenty of alternative activities like tubing (including "extreme" tubing), snowskating, snowdecking, snowshoeing, snow cycling, sno-scooting, ice skating, horseback riding and a climbing wall; a grooming map is printed and passed out daily; special teen lessons and twilight parties; A Burton Progression Park; family private lessons; good slopeside lodging; the town, Lincoln, has sufficient distractions to entertain off-slope; and a genuine steam train transports folks from one base lodge to the other. Downside: somewhat awkward trail layout; minimal truly expert challenges; limiting dining/diversion options at the base. The Balsams, NH (www.thebalsams.com): You won't find big-time skiing here, but you will find big-league hospitality. The hotel is one of the original New England "grand" hotels, dating from a time when grand really meant grand. The array of activities, the food and what you get for your all-in-one package makes this a great value. The rooms have no TVs, but there's a library for borrowing books and the game room has billiards, ping-pong, arcade games, and family board games. Yes, if you must, there is a television room, or movies play movie in the theater. Downside: the hotel is way, way north, miles from everywhere; the ski hill is a novice-intermediate. Jiminy Peak, MA (www.jiminypeak.com): Our choice for the best of the smaller northeastern resorts, Jiminy has nice slopeside lodging, a user-friendly single base area with recently added retail, amenities and kids' center. They've created superb intro to ski/ride programs, which is augmented by a kids 12 and under stay free program, it's easily accessed from major northeastern metro areas, and they've installed a "coaster" ride to entertain non-skiers. Downside: being more southerly, rain can be a factor, you must travel a bit to shop, and it might not keep better sliders occupied for more than a day or two. Ascutney Mountain Resort, VT (www.ascutney.com): One of Vermont's smaller, more intimate resorts, Ascutney is family-run and all about family. Kids get a special warming hut; all trails converge at the main base lodge; all lodging is slopeside; the fitness center holds an Olympic-sized indoor pool; there's a new spa; and apres ski includes bonfires, ice skating, tubing, Cheddar's Happy Hour for kids, a teen center, a movie theater and an arcade; ski-and- stay packages are a great value. Downside: the hill is relatively small compared to some of its nearby neighbors; there's limited on-site dining. Okemo Mountain Resort (www.okemo.com): Here's another family-owned, highly family-oriented resort. Indeed, when it comes to families, few do it better. The sprawling, multi-peak ski hill is immacuarley groomed and a novice/intermediate paradise; lodging of nearly every stripe is available slopeside, from condos to hotel rooms; new ice skating and swim/fitness facilities are state-of-the-art; kids programming and special events are top notch; terrain parks rule; customer service is a serious priority; and the variety of ski/lodging packages is seemingly endless. Downside: not much expert terrain; after a while, the innumerable intermediate groomers seem repetitive; the main base area can be a real zoo, with novices being overwhelmed by fast- flying experts returning to base (use the Jackson Gore base area instead). Crystal Mountain, MI (www.crystalmountain.com): Here's another family-owned hill that's, you guessed it, family-friendly. Do we see a pattern developing here? Ski-stay packages galore are offered, with lodging of all kinds slopeside; night skiing, including night Nordic; terrain parks for all; excellent on-snow programs; ice skating with rinkside bonfires; moonlight snowshoeing; indoor pool; fitness center; an Art Park (now that's unique); face painting; and story time. Downside: Just a 375-foot vertical (well, this is the Midwest). Boyne Highlands, MI (www.boyne.com/BoyneHighlands): Well, in truth, it's the water park that makes Highlands unique. Called Avalanche Bay, it's replete with slides, rides, kids' pools, climbing wall, lazy river, and a surfing simulator all attached to a hotel. Oh yeah, you can go snowsliding and do all the requisite winter activities like snowshoeing, dogsledding, snowmobiling, tubing, etc. ; but, we bet getting those kids out of the water will be a challenge. Downside: Limited vertical, kind of a long drive from Chicago and Detroit. Lutsen Mountains (www.lutsen.com): Ninety runs on four peaks with the Midwest's highest vertical and more than 60 acres of tree skiing make Lutsen one of the region's most diverse resorts. A full range of lodging options, many of them ski-in/out, makes it an easy to handle destination. A Family Festival in early February, plus a variety of kids-free packages make it an excellent value. The area also offers some unique off-slope pastimes like overnight dogsledding and canyoneering, plus untold miles of Nordic skiing and snowshoeing. Downside: Well, it can get mighty cold up there in the far north with the winds coming off the shores of Lake Superior; it's remote a 4.5-hour drive from Minneapolis, 90 minutes from Duluth. Steamboat Springs, CO (www.steamboat.com): Steamboat invented the "Kids Ski Free" program, and still do it wonderfully you buy it (lift tickets, rentals, lodging, etc. ), your kid does it free, and they've added "Kids Fly Free," as well. There's good early- season discount packages, an excellent ski school and day care, special kids-only lifts, and a real town in which to play, shop and dine or watch ski jumping competitions. Along with a full range of terrain with fantastic tree skiing, there's a full range of lodging, slopeside or otherwise, and a free bus system that goes everywhere. Downside: the lift system can be a bit awkward; relatively low elevation can sometimes cause iffy snow; base area and getting to/from outlying condos can be confusing. Solitude, UT (www.skisolitude.com): This is big mountain skiing with a small resort atmosphere. Very family-friendly, indeed, is the tiny, self-contained base village that offers all the basic necessities (ice skating, family dining, fully-equipped condos, spa, babysitting, outdoor heated pool, kids-only game room), and it's small enough that nobody will get lost. Activities? Kids' glow light parades, storytellers, puppeteers the list goes on. The hill has literally every kind of terrain and lots of it, plus a terrain park specifically designed for families. It's all very calm and quiet, just as the name implies. Downside: A bit isolated; might not keep teens sufficiently occupied; might be too low-key for some. Schweitzer Resort, ID (www.schweitzer.com): Perhaps too little known outside the Pac-Northwest, Schweitzer hidden away up there in the Idaho panhandle actually has the most skiable acreage in Idaho, including Sun Valley. And, it has Idaho's only six-pack chairlift. And, it has a variety of slopeside lodging that has not yet reached the overwhelming stage. And, it has incredible views of Lake Pend Oreille. And, it offers many ski-stay packages, some with kids ski/stay free. Add childcare, terrain parks, and the expected alternative activities (plus the unexpected on-site snowcat skiing on 4500 acres or so), and you've got great value. Downside: It's a long way to there from most anywhere (90 minutes' drive from Couer d'Alene); an obscuring fog can rise from the lake hindering visibility; limited night life, dining and shopping. Grand Targhee, WY (www.grandtarghee.com): Our favorite "small" Rocky Mountain ski resort, it has a cute-as-a-button, self- contained base village (which will soon be expanding), a single bottom base area and an overall manageable size. Kids 14 and under ski/stay free, incredible amounts of high-quality snow falls here, there's fine day care and ski school programming with zero crowds (even on weekends), plus on-site snowcat skiing and the ability to ski Jackson Hole for a day or two. Downside: Targhee is isolated with little shopping; the prevalent above- treeline skiing can be impossible in a whiteout; and there's the possibility of being stranded by bad road conditions when trying to get to/from Jackson Hole. Marmot Basin, Jasper, AB (www.skimarmot.com): Alberta's "other" ski area, Marmot sits in Jasper National Park, and to say it's beautiful would be a serious understatement. There's ski terrain aplenty, and myriad other activities from ice canyon crawling to wildlife-spotting snowshoeing. Or, if you stay at the Jasper Park Lodge, the wildlife (elk in particular) will wander right up to your door. You don't come here for the convenience, the wild times or the crowds. You come here to bask in Mother Nature at her finest. Downside: It's far (three hours' drive from Banff, four from Edmonton); it's far north and so can be cold; there's no slopeside lodging. Red River, NM (www.redriverskiarea.com): Funky. And very fun. Red River is a relatively small ski area one of the "other" New Mexico resorts that are not Taos or Santa Fe but this old mining town is not only a riot, it's a pretty good bargain. Kids ski/stay free during non-holiday periods and most of the lodging is either slopeside or a short strut from it. Or, for 50 cents you can ride the town trolley. There's a regularly scheduled torchlight parade, a huge Mardi Gras celebration, tubing and almost all the dining is family-oriented, with an emphasis on western steaks and the like. Come spring, "Beach Days" features hula hoop contests, and a flashlight parade for kids 12 and younger. And, multi-day lift tickets run about $50/day. Downside: No true upscale lodging; can be raucous during holiday periods, which is bad if you want peace and quiet; not a huge hill. Keystone, CO (www.keystone.snow.com): Keystone is the "forgotten" member of the Vail Resorts family, but offers fantastic lift/lodging packages that include many other on/off- slope activities; kids ski free; high standards for day care and ski school; night skiing; pipe/park with family lessons on how to use them; interchangeable lift ticket with Breckenridge, Vail, etc; and terrain that expanded in 06-07. Downside: many base areas; tends to get snow later than its neighbors; limited shopping/dining on-site. Mt. Bachelor, OR (www.mtbachelor.com): Mt. Bachelor has incredible terrain for kids of any age. Lots or rollers, intermediates, and great parks. The topography in general is very cool you're skiing on a volcano. The ambience here is nicely low- key. Their Little Rippers program for 4-5 year-olds guarantees ski class sizes of three maximum, and family private lessons are offered. Lodging at places like Seventh Mountain Resort can include lift tickets, plus skating, dogsledding and snowshoeing. Downside: No slopeside lodging, and closest is several miles from the hill; mountain amenities are fairly basic as well. Heavenly Resort, CA/NV (www.skiheavenly.com): A whole new world has been born at Heavenly in recent seasons with the advent of the so-called Park Avenue Project, the Village at Heavenly and the new gondola that runs from it. Now there are more than 5,000 rooms within walking distance of the lifts not to mention upscale shopping, an outdoor ice skating rink, and a multi-plex cinema. (Bring the kids to Fire & Ice Improvisational Grill where they can choose their own food and watch it being cooked on a huge circular hibachi grill.) Heavenly, of course, has size 4,800 acres, 86 trails and three bowls. Adventure Park, atop the gondola, offers high-elevation snowtubing, snowshoeing and Nordic skiing; and the off-hill activities can include a Lake Tahoe cruise. On-hill are all the expected facilities (although make your day care reservations as far ahead as possible). And, if you pack a babysitter along with your entourage, parents can go play at the casinos on the Nevada side of the state line. Then, there are the views of Lake Tahoe, which are second to none. Downside: South Tahoe/State Line can be crowded and traffic-laden (despite steps to alleviate the problem). Mt. Rose/Reno, NV (www.mtrose.com; www.visitrenotahoe.com): Reno, long known as America's "divorce capital," has come a long way baby. And, Mt. Rose offers surprisingly good skiing for all levels, and most of the major hotels not only offer surprisingly affordable lift/lodging packages, but shuttle busses to the slopes stop at their doors. And, if you want more skiing choice, there are packages with, and transport to, most of the larger Lake Tahoe resorts. Reno also has a large outdoor skating rink and a world- class automobile museum. Downside: A commute to skiing daily; Mt. Rose has no day care. Big White, BC (www.bigwhite.com): Sister resort to Silver Star, Big White was created for families. We're talking about ski weeks that feature a skating party every Friday, a games-and- movie night for 6-12 year olds, a Wednesday theme night and fireworks, and a Carnival Night. Parks galore dot the mountain, from the Plaza mini-pipe right at the heart of things, to the TELUS Terrain Park that features a park, rail garden, half pipes, boarder/skier-cross, and a fun family race area. Lodging on the mountain is plentiful and runs the full range from hotel rooms to chalets. Snow conditions here are about as reliable as anywhere on the continent, and the base village is so convenient that the main street in it doubles as a ski run and pedestrian way. And, then, there's the Mega Snowcoaster Alpine Tube Ride, the largest mountain tube park in North America. Downside: it's a bit hard to reach for folks from stateside, requiring a commuter flight from Calgary or Vancouver. Crystal Mountain, WA (www.skicrystal.com): Yes, you could commute here from Seattle (just 90 minutes' drive); you can also park your RV for $20/night. But, you can ski-and-stay at places like the swimming pool equipped Alta Crystal Resort for very reasonable prices. The base and immediate area facilities are good enough to keep you happy, but not major resort-style overwhelming, and the snowsliding is first rate. Downside: No daycare; limited apres-ski and alternative activities. Diamond Peak, NV (www.diamondpeak.com): This too often overlooked Tahoe resort is way family-friendly. Consider: a parent interchangeable lift ticket that allows one parent to hang out in the lodge with the little one while the other skis, and then switch roles; the Family Special of discounted parent/child ticket combos; Bee Ferrato Children's Center programs that include Ski-and-Play program for little ones (three years old); five-star lodging at nearby Hyatt Regency Lake Tahoe Resort, Spa and Casino or excellent low-cost packages at the Tahoe Biltmore Casino and the Inn at Incline Motor Lodge and Condominiums; all this will the best lake views of all the Tahoe ski areas. Downside: No slopeside lodging; no daycare; the resort is somewhat isolated from much of the Lake Tahoe activity. Red Mountain, BC (www.redresort.com): A small British Columbia town and a relatively small mountain, so why bother? Because it doesn't get much more friendly than this and this hill has 360- degree skiing, with some of the most challenging tree-sliding anywhere. And, while the resort is growing in terms of development, there's still this wonderful small town atmosphere that makes everyone feel welcome, and the option to ski/stay in basic accommodations or upscale slopeside digs. There's daycare, good kids' programs and you can even go watch curling matches at the local ice arena. Downside: You're rather remote here, 125 miles north of Spokane; no rollicking major resort action off the slopes; the town shuttle bus runs only when the lifts do.